I have now completed what was left in the boxed area at the bottom (see shots below) and also sorted the small border along the bottom edge too. 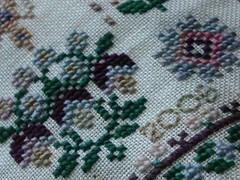 Here is where you see me up to now, doing this wide blue floral band. 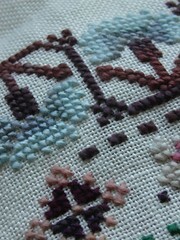 I only have a letter band, then the bee border to go! If you can’t wait to see this finished, click here. This pair of roses took ages to do. 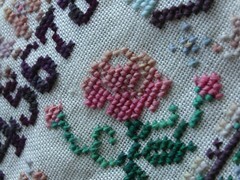 The silk thread (Caron watercolours) kept separating and you really had to ‘paint’ with it to get the rose looking right.